The first lames above the front and back "bib-plates" (or should I call them mantle-plates or something else??) were difficult to fit so they mate well with the bib-plates. The front one was not too bad, but it took me three tries to get the lower back lame to fit right and I'm still not entirely happy with it. It articulates well, and it does not dig in or bite anywhere, nor does it show from the outside, but it seems like it could fit a bit more closely than it does. 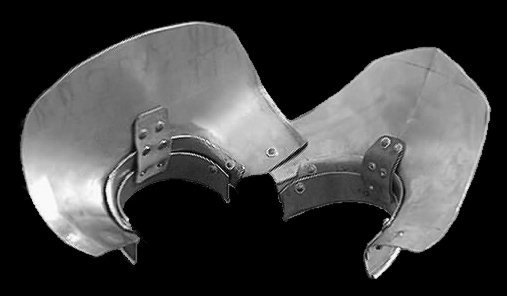 One other thing is the hinged/pivoting side of the gorget that allows it to open... there should be a hinge connecting the front and back top lames, but I was not sure how to hinge it and get it to work with the pivot point on the shoulder. I've only seen a couple pictures of these that show the hinge/pivot side, but the gorget is always closed so I can't really see what is going on with the hinge and pivot. I have two theories: one is that the pivot on the shoulder is actualy a sliding rivet, and my other theory is that the hinge might be on sliding rivets. But I could not tell if either of these was done in any of the pictures I saw. Another thing that is different about the gorget I made is that all the other gorgets I saw used 6 leather strips (3 in front, 3 in back) on the inside to hold the lames up and help with articulation. I only saw need for the front and back center strips. Things I'll do different in my next one (aside from just doing an overall better job)? I'd like to braze some rivet nubs to the inside of the neck lames so I don't have to worry about hiding the heads under the overlaping lame. I think I could get a greater range of motion if I had more choice about where to attach the leather to the lames without worrying about the rivet heads showing up on the outside and messing up articulation. I am fairly pleased with my edge rolls on the top neck lames, maybe I'll try roping the next ones I do. Picture of the gorget from the front. Picture of the gorget from the back. 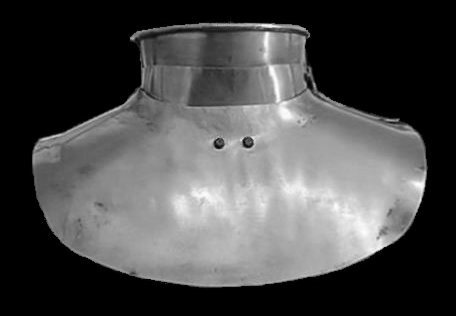 Picture of the gorget in profile. Picture of the neck area from the inside. It is not noticable from the outside, but some of the lames were trimmed down in places where they tended to bind with other lames. It was not something I planned, just a trim to fit sort of thing. 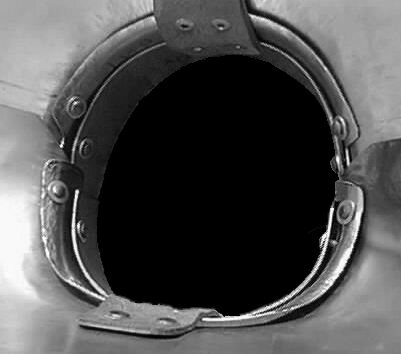 Picture of the inside of the gorget opened up. 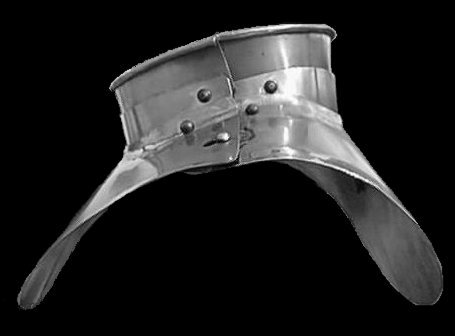 Now as mentioned above, I should have somehow incorporated a hinge into the top front and back lames, but with the type of pivot I used, there is a huge gap when the gorget is opened. With the pivoting arrangement I have now, a hinge would keep the gorget from opening unless one of the holes for the pivot was sloted, or the hinge was somehow attached with a slotted rivet.